I must be brief. Thanks for your patience waiting for a new posting at HogueProphecy.com. 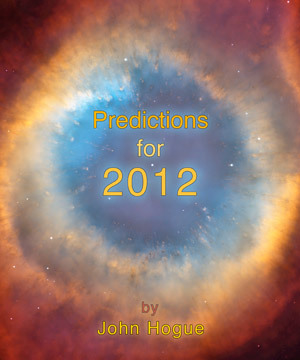 Since end of November, all my mental, emotional and psychic resources are trained upon one goal, the completion of Predictions for 2012. This will be the largest annual almanac I have yet written. It could be as much as 65,000 words when it is finally completed, hopefully soon. The deadline for donators getting their special edition, electronically autographed, advanced copy will possibly be pushed forward towards the winter solstice. One thing I can assure my readers who have already sent your advance for the book and those readers who will yet send, that this new e-book will be downloaded to you before the worldwide release to the world at large. You should have it as my gift for Christmas at the latest. Click on this link 2012 to learn how you can get your advanced copy. In the meantime, before I plunge back into the “bliss”-krieg process of bringing the new e-book rapidly into the world, I will post for you today this unique interview I gave online to Scarletwhore.com back around 8 March 2011. Inserted in the interview are some updates added in August 2011. I want to thank the people at Scarletwhore for inviting me to say something and I invite you all to check out their great site on prophecy and current events. 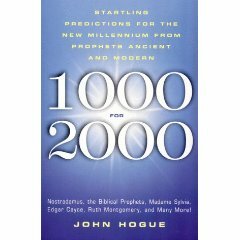 John Hogue does not need an introduction, most of you know him as the Nostradamus expert. He’s got a list of T.V. and radio appearances that few in the fringe world of prophecy, predictions, and apocalypse can dream of. He is the author of more than a dozen books, with over 1,500,000 in print in 19 languages. His website should be on the shortlist of top ten alternative information portals on the web. John Hogue is the quintessential ‘rogue scholar’, he is not dogmatic and set in a narrow paradigm of interpretation… he calls it as he sees it and rarely is he off the mark. The $12.50 I spent on his Predictions for 2011 is the best download I paid for this year. John Hogue is extremely insightful and sticks to his guns, he’s not afraid to admit when he’s wrong and more to point he understands the ebb and flow of a quasi deterministic future that exist in the realm of free will participants. Everything is foretold, but we still have free will. John Hogue gets it. When I read his 2011 predictions I felt like he was putting in words everything I felt intuitively about our world. 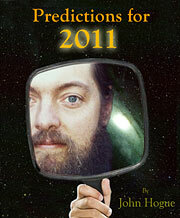 After reading Predictions for 2011, I had a thousand questions I wanted to ask him. John, we might be thousands of miles apart but we are all the same rock and what happens in one part of this planet is going to affect us all. Has the natural balance been lost? Will the Earth deliver a wake-up call to humanity this year? Conditioning plays a subtle and mostly unnoticed influence on how we interpret or anticipate the future. We are programmed to expect the future to apocalyptically explode upon us like a Roland Emmerish movie. 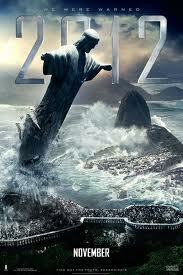 We look for Hollywood effects of his movie 2012 sliding California into the ocean. We look for climate change to superstorm in overnight like in his Day after Tomorrow. The fact we overlook for decades now is that the balance of nature is already lost and we are already listing from a tipping point in climate change that is too gradual for our Holly-wooden headed mindsets to pick up. Poster for the Roland Emmerish block buster "2012." We seek apocalyptic times grilled up hot and fast with an order of globally warmed fries — fast food style in less than a American-impatient minute. Nevertheless, global warming and climate change is coming at us a little slower, like an afternoon-long seven course French lunch that is equally going to be French-fried. History is quickening but not yet at a pace of wake-up calls most people want to recognize. In my almanac of prophecies (see 2011 predictions), I said this would be the year when the mainstream starts hearing the first clangs of alarm bells of the unsustainable. I pinpointed two wake-up calls: food sustainability and a redoubling of violent weather, seismic events and other natural disasters that are made unnaturally destructive by humanity’s wholesale abuse of the planet and its climate. Another bell ringing alarm though less noticed by people is the birth of the 7 billionth child set for 2011. Also it would seem that my oft documented warning of a second global economic crisis in the first half of 2011 is on track for fulfillment, and the source will be a rise in oil prices beyond $100 a barrel that continue to climb. It is important to note here that though Arab revolutions play a powerful factor in the oil price rise, the real cause is something far more systemic to our habit of growing demands that cannot be sustained by how we have worked things in the past. Oil and food prices are going up because emergent middle classes around the world are demanding food and energy the global supersystems of oil, energy production and agriculture cannot sustain. If the wake-up calls are not being heeded now, they will be in 2020, at a time when it will be far more difficult to turn destiny around without much of the world plunging into a new wave of Fascism. 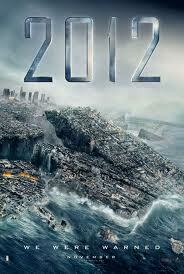 Santa Monica, California, sinking into the ocean as backdrop for another 2012 movie poster. Today’s conditioned reflex to anticipate fast food, Roland Emmerich-like, Teutonically Wagnerian, Hollywood style wake up calls will lead to emergency rule in the 2020s that looks a whole lot like Germanic Fascism of the 1930s and 1940s. I do not want that future. That is why I am scaring the be-jeesus out of readers now. Pull your head off the big mac, boys and girls. The tipping point is lurching since 1998. Wake up now, while you can still enjoy the freedom to wake up at all. The great Jewish Philosopher Rambam said in effect that Everything is foretold, but we still have free will. How do wrap our heads around this concept? Is it all predestined as written in the Book of Revelation or the writings of Nostradamus? There are many destinies for sale in the wholesale store of Time. All the potential futures are lining the shelves of Cosmic “Costco”. Coming through the sliding doors from the present is a purchaser of a future. An individual “buys” a future by his or her actions. He or she possess it, identifies with it, thus it changes a person’s life. We become what destiny we consume. The potential future procured either gives the customer positive or negative future stimuli. A million Cosmic Costco purchasers collectively buying and moving “units” of destiny is a mass of actions causing future reactions and by consequence, creating trends. These trends are our future history. 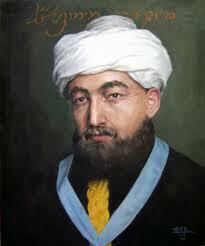 Thanks to Scarletwhore, I can introduce you to the noted Jewish mystic, Rabbi Rambam (thank you, mam). Rambam is on the right track. Though, from my experiences of glimpsing this state of awareness, I would propose that all things are happening at once, forever. How we track them says more about the level of our awareness and the limits of the particular corner of the “multi-verse” in which we live embodied or dis-embodied. Nostradamus has a different way of saying the same thing Rambam may be implying. What I gather about Nostradamus’ take is his tortured and dyslexic attempt to describe what a prophet can sometimes tap into by the grace of the divine: a continuum of events that are on the periphery of witnessing consciousness. The prophet momentarily glimpses this and if he or she is a skillful and unattached medium, he or she can describe for us the potential inclinations of our future trends days, weeks or hundreds of years hence. The future is not “this” divine witnessing. Nor is the past. Yet, the present is the doorway through which a remembrance of and union with this witness can be understood. You use this term ‘Super System’. You say ‘All of these supersystems are super-overstressed.’ Are we at the breaking point of these super-systems? And what are the signs when they begin to collapse? In the year 2011, we begin hearing the ringing alarms of large artificial and natural systems that sustain a global civilization and an ecological balance of nature. For instance, the natural world has the supersystem of ocean currents, jet streams, monsoons, the supersystem of rainforests that refresh the atmosphere and so on. These sustain the climate and weather balance of nature. Starting in 1998 and accelerated further since 2008, the natural climacteric supersystems have begun to go awry in a way that at last has become noticeable even to the mainstream mass semi-conscious minded humanity. They may be generally still in denial to the cause of climate disruption but as we experienced wilder weather every year, especially a quickening of such last year in 2010, most people on earth will agree there is global weirding of the weather even if a majority do not believe in global warming as the cause. 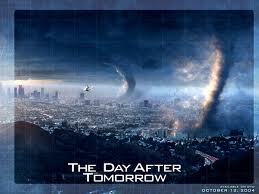 Los Angeles hit by freak super cell tornadoes in Roland Emmerish's movie "The Day After Tomorrow". The year 2011 will be remembered as the time humanity’s artificial supersystems began showing the first signs of their potential collapse later on in the 2020s. In my forecasts for 2011 written in October through early December of last year, I forecast the first alarm bell of an approaching failure of supersystems would begin ringing this year, such as in the supersystem of food production. This is now happening as foreseen because the natural supersystem of the climate is coming unhinged and redoubling the weather and earthquake violence of 2010 in 2011. Russian grain exports halted because of droughts and fires in 2010, grain belts of Australia submerged in catastrophic floods from a more potent monsoon laced with enhanced cyclonic storms (hurricanes). China’s wheat exports are way down because of wheat crop failures from central continental droughts besetting all continents, another sign of a climate supersystem beginning to collapse. These have lead to skyrocketing food prices. Food prices triggered revolutions in early 2011 across North Africa and the Middle East. Food has often been the match of revolutions in the past, and I predict that more will spread beyond the Middle East and North Africa because of this first “tilt” warning, flashing in the supersystem of food sustainability. The next alarm bell is the birth of the 7 billionth child in 2011. You see the signs of his supersystem collapse in the rise of commodity prices as we now begin to add another American-sized middle class population to the planet every five years. Three hundred million new consumers begin demanding that our overstressed supersystems of food, oil, construction materials and other commodity supersystems supply its exploding demand. It is not possible. Not the way we think and unconsciously live today. A more enlightened society could sustain a healthy, spacious planet with 50 billion people living well off upon it. Our childish civilization cannot do that. Little children left to their own devices cannot clothe, shelter and feed themselves. We live in that society. The signs of the beginning of the collapse of childhood’s civilized end are the rising prices in everything. They rise because too many children are selfishly grasping for the resources. Their demand is too large to sustain. Thus you will have a lot of cranky babies out there, revolutions and civil disruptions. The process will be terrible and painful. It will take decades before a newer more mature civilization could emerge out of the chaos of the 2020s. Perhaps it arrives by the 2050s. It could arrive right now, if people heed these warnings and change destiny’s course. What is the tie that binds? Is it God, the Universe, the universal consciousness? What is the source? And how do we tap into it? Or maybe we are already tapped in… but we went in search of many schemes. I would say it is more the “or”, the last part of your question. That we were gods playing a game? In the dark and secret corners of your being. 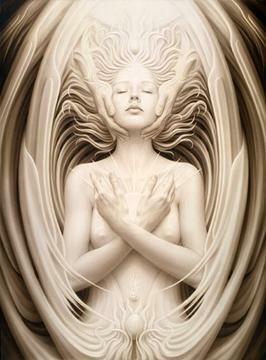 It is the Ever-“Yes” awakening in thee. So that it echoes sweet fulfillment back from the halls of the future. What are a few things that you predicted that came true? For starters, I seem to have the ability to pick the victor by popular vote of every presidential election since 1968. That is an 11 and 0 record so far. Next to that, I have a good track record for predicting the weather for each new year. For instance in Predictions for 2009 I said the Gulf States region would have a quiet Hurricane season except for a modest tropical storm hitting Florida and the Carolinas. These turned out to be the only paces having tropical storm events that year. In Predictions for 2010 I said the US Gulf States would once again enjoy a very quiet Hurricane season at a time when most weather forecasters were predicting a very violent hurricane season spreading the Deep Horizon oil spill. Though there were many hurricanes that season, they boiled and roiled off in the Atlantic Ocean. No hurricanes hit the northern waters of the Gulf or visited the Gulf States except a rainmaker hitting the southern tip of Texas but mostly going into Mexico. Cannot predict a quiet season for 2011, unfortunately. I documented one of my more notable hurricane predictions in the book 1000 for 2000 Startling Predictions (1998). I later repeated that prediction on Fox News for the Hannity and Colmes show on 31 December 1999. I reiterated that either New Orleans or Miami would be devastated in the first five hurricane seasons of the new century by a super-hurricane. As we know, Hurricane Season number five saw New Orleans devastated by Hurricane Katrina. I presaged in 2008 that an African American would become Chairman of the Republican Party in 2009. Then came African American Michael Steel to the post. At the end of 2007, I predicted the Great Recession for later on in 2008. I also said this on the record on Coast to Coast AM in January of 2008. I also said Obama would be a two term president on that show in early 2009. Got a lot of angry mail for that. A lot of anti-Obama people thought I was nuts. Well…look at the current Republican bullpen of potential candidates for 2012. So far, it does not look too promising that there will be an upset. But we will see. For me some of the more unsettling fulfilled predictions revolve around things that just drop into my awareness out of the blue and go against my own mind, such as predicting the rise of lone wolf terrorists in 2009, followed by lone wolf domestic terrorist attacks in 2010. Getting the unemployment numbers right for the Great Recession was chilling to me. One of the most inexplicable and detailed prophetic hits happened in 2009. That was months before the strategy meetings happened between Obama and the Pentagon over Afghanistan. The oracle grasped exactly what transpired in the future; namely, that Obama would give the Pentagon a troop surge of 40,000 soldiers (10,000 of which were NATO allies) but hold them to an 18-month deadline to turn the tide or he would begin combat troop withdrawals by the summer of 2011. How serious is the potential collapse of Bee populations? The Bee Plague was a bee’s version of the pandemic of the Black Death of the high Middle Ages. In the bees’ case it was caused by crowding of industrial hives to produce more honey. Right now the Bee plague is going dormant, but like the bubonic plague on humans, it will return and subside return and subside. After the Black Death in the 1300s more localized and regional Black Death appeared and retreated throughout Europe and the rest of the world up to the 1700s. One might hope that the bee plague will do no worse, but I would add that the honeybee has become the new canary in the mind shaft, as it were of climate stress on animals and humans. The times of great pandemics are coming again. If not in this decade (watch for 2013-2014 as one important window) then definitely in the 2020s and 2030s. What do you think we could be blind sided with this year? Beyond a Korean War, Attack on Iran or dollar crash. 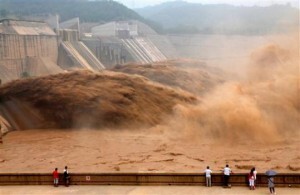 Three-Gorges Dam in recent Yangtze floods. A North Korean collapse is more likely rather than a war. No attack on Iran, even though so many people expect it. The economic crisis stemming form oil prices shooting up beyond $100 was what I said back in 2009 for predictions for 2010, would be the trigger of the next economic crisis. The window for danger opened in October 2010. I said in 2010 that March and April of 2011 would be the most dangerous months of this. 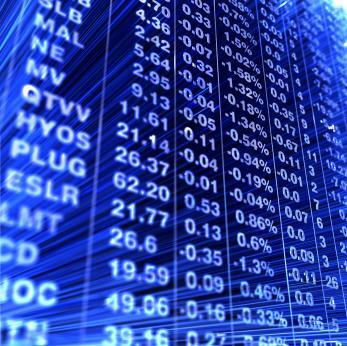 Now we have oil rising over $100 and perhaps set to match its all time high of $148 or more because of food and fuel price upheavals and panics in the market around March and April. But the danger is not over if we pass into May through July, because the impact of grain lost to the global markets by Russia’s lingering lack of exports, Australia’s grain mostly good only for livestock because of cyclones. There is also America’s winter wheat crop suffering a lower yield than promised in exports because of a series of violent blizzards early in the year. These will rapidly, as predicted, shift suddenly into violent tornado infested storms of spring across the grain belts of America. Also, there is the 2011 hurricane season which will be at least if not more devastatingly violent than the 2005 season best known for Hurricane Katrina. Oil price climbs may also be threatened if Houston refineries are in the storm line of a great hurricane this year. Prophecy likes to date events but free will does speed up or delay events. It is possible that these surprises can be delayed into 2012 or 2013 but at this time of writing (8 March 2011), the trends appear to be on course. There are also pleasant surprises that might blind-side us this year or next. I spent a whole chapter in Predictions for 2011 on a five year process Israel’s leadership might take that could see Iran isolated and the Palestinian State established. That future IS available for Israel if its leadership uses the rise of democratic desires across the Arab world to make peace with its Arab neighbors and thereby leave Iran as the sole remaining threat to the Arab world. An Israeli-Iranian war may happen as a result with the US allied in the fighting with Israel, but there is time for moderate voices in Iran to prevail. I foresee the war danger not coming until the present times enter the year 2015 and 2016. There are many more details about the economy, the future of the US military presence in the Middle East, where it is shifting next, the oncoming “Cold Depression” which is like a Cold War in economic terms, etc., that people can read more about by clicking on predictions.